Create a new text frame on the first page and type continued on page. Use the Selection tool to select the text frame you just created. Move the text frame so that it slightly overlaps the text frame containing the story. 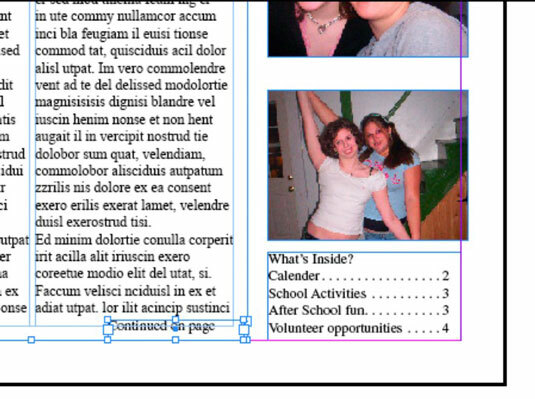 Let InDesign know what text frame it’s tracking the story from or to. Overlap the two text frames (and keep them overlapped) so that InDesign knows to associate these text frames (the continued-notice text frame and the story text frame) with each other. Double-click the new text frame, which contains the text continued on page, to place the insertion point at the spot where you want the page number to be inserted. The page number is inserted at the insertion point, so make sure that a space appears after the preceding character. Choose Type→Insert Special Character→Markers→Next Page Number. A number is added into the text frame. The number is sensitive to the location of the next threaded text frame, so if you move the second text frame, the page number updates automatically. You can repeat these steps at the spot where the story is continued from — just choose Type→Insert Special Character→Markers→Previous Page Number in Step 5 instead.